Oprah once shared that her first big splurge when she started working was on good quality towels. I agree that wrapping yourself in a soft towel is the best feeling, especially at this time of year when you get a hot bath during cold weather. Many people have told me that they are clueless when it comes to buying new bathroom towels. One mom told me that it's easy to buy sheets because she just looks for high thread counts. On the other hand, she told me that she has no idea about how to buy good quality towels and feels like Goldilocks because she has trouble finding towels that are just right. In today's post, I'll share tips for how to buy good quality bathroom towels and break down key characteristics that you should consider. Of course, we will consider your personal preferences while focusing on quality since you want to combine these two considerations. When you buy towels, you need to consider your own personal preferences while also looking for key characteristics of good quality towels. For instance, some people like thinner towels while others love thick towels. In either case, both want good quality towels that are soft, absorb moisture, and hold up over time. Size - Choose the size of towel that you prefer. Typical ranges include a standard bath towel of size 17"x52" to 17"x58" and a hand towel of 16"x28" to 16"x30". 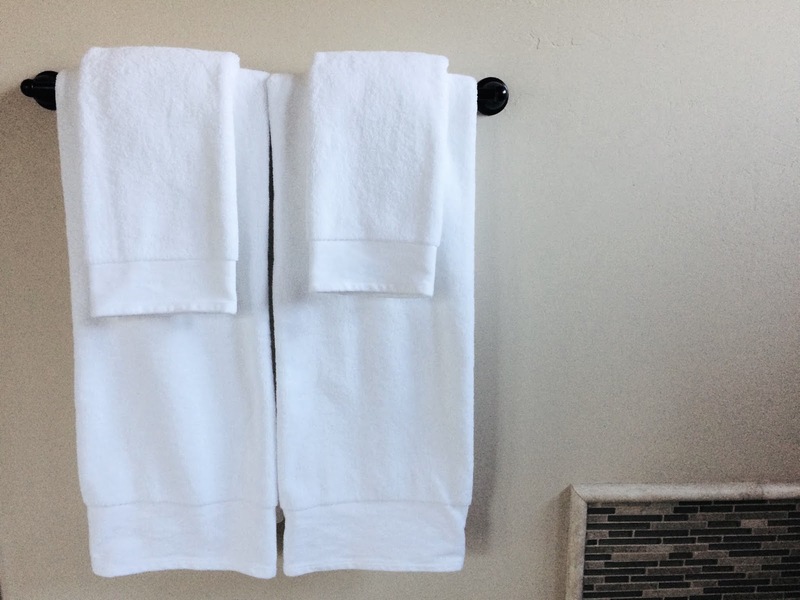 Extra luxurious towels may be even larger. You may also prefer a larger bath sheet or other size. 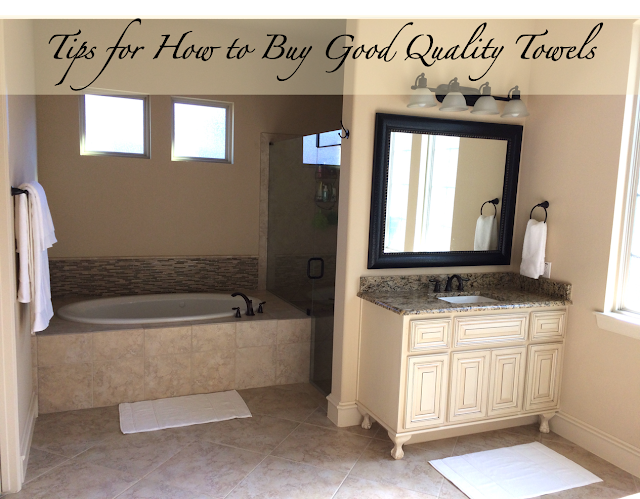 In any case, if you stick with standard sizes, you should be able to find good quality towels. Weight - Some towels report their fabric weight in GSM (grams per square meter). A lower number means a lightweight and thinner towel such as a gym towel. A higher weight is a thicker and heavier towel, typically the kind that you keep in your bathroom. Thinner towels typically dry quicker than thicker towels. Color - We recommend white for a clean look that is also easy to wash and maintain a fresh look over time. At the same time, pay careful attention to the washing instructions. For instance, some people assume that they should bleach their white towels. If a towel is labeled that you shouldn't use chlorine bleach, don't use bleach because it may weaken fibers and, as a result, the towel will lose absorbency quicker over time. Now let's talk about characteristics that apply more broadly. Softness: I think that we all want soft towels. However, be careful when you shop for towels in-store based on how they feel before they are washed. Many companies use special softeners to make a towel feel softer than what it actually feels after several washes. Keep this in mind when you are shopping for towels and pay close attention to the weight, characteristics of the cotton, and reviews for the particular brand and style. Combed cotton: When you see this terms, it means that the manufacturer removed shorter threads so that the longest threads were woven into the towel. This increases quality and prevents some pilling. Combed cotton is often capable of holding up to 25x its weight in liquid. Types of cotton: Many towels are made of standard cotton. Still, there are variations among types of cotton and a couple stand out for luxurious towels. Turkish cotton differs as the fibers are longer, providing a softer feel and higher durability, typically absorbing moisture better than standard cotton towels. What's interesting is that Turkish cotton also becomes softer and fluffier with washes. (I'll share some sample towels below where I found that this is true!) Supima cotton is another superior type of cotton that has extra long fibers, similarly providing a softer feel, durability, and ability to absorb moisture. Supima cotton represents less than 1% of the cotton grown in the world and typically grows well in the USA. Egyptian cotton is a third option for premium towels thanks to the extra long fibers that are often more absorbent, but takes longer to dry. Banded edges: Towels with banded edges will typically reduce fraying. That's why you usually see banded edges on good quality towels. Decorative towels: Towels with jacquard designs, embellishments such as beads, and printed designs are typically designed for decorative purposes and often do not hold up as well as traditional bathroom towels. Finally, once you purchase your bathroom towels, let's review some tips for keeping them clean and fluffy. Wash your towels before using them: Many companies spray softeners onto the fabric, so it's best to wash your towels before the first time that you use them. Avoid fabric softeners: Unless your brand is labeled otherwise, you should avoid fabric softeners as this inhibits absorbency. Avoid bleach unless otherwise labeled: As mentioned above, if a towel is labeled that you shouldn't use chlorine bleach, don't use it because the bleach may weaken fibers and, as a result, the towel will lose absorbency. Wash, fluff, dry, and fluff again: After you pull your towels out of the washing machine, fluff them by hand before you put them into the dryer. After you remove them from the dryer, fluff them by hand again. Now that we've shared advice for characteristics of good towels, let's share some actual examples. Personally, in addition to the characteristics above, I also rely on recommendations from friends, family, and online reviews. Personally, I feel like Lands' End is the best place to shop for towels because they carry a variety of luxurious towels with excellent reviews. They have a nice variety of good quality towels that fit different personal preferences. There are a few versions that I will tell you about because they are all excellent quality, but cater to different personal preferences. My family has tested all of these towels and washed them dozens of times to observe the quality. Let's start with the heaviest towels - The Turkish Spa Bath Towels. This is my son's favorite because he likes ultra soft towels that are heavier and absorb quickly. The tradeoff is that heavier towels typically take longer to dry, but he is fine with that since he typically only showers once a day at home and the towels definitely dry within 24 hours. This towel is excellent quality and weighs in at 750 grams per square meter. This translates to pure luxury because this soft and thirsty cotton absorbs quickly and has a smooth feel. It's not surprising that this towel set has almost perfect reviews from customers and that there are people who exclusively buy their towels from Lands' End. Now let's talk about the second heaviest towels - The Supima Bath Towels. This is the line of towels that I personally love the most. They are a bit lighter than the Turkish Spa Bath Towels that my son loves, weighing in at 650 grams per square meter. I love that these towels are incredibly soft, super absorbent, and dry relatively quickly. I shower twice per day, so the fact that these are so soft and absorbent while also being able to dry so quickly makes them a good fit for me. 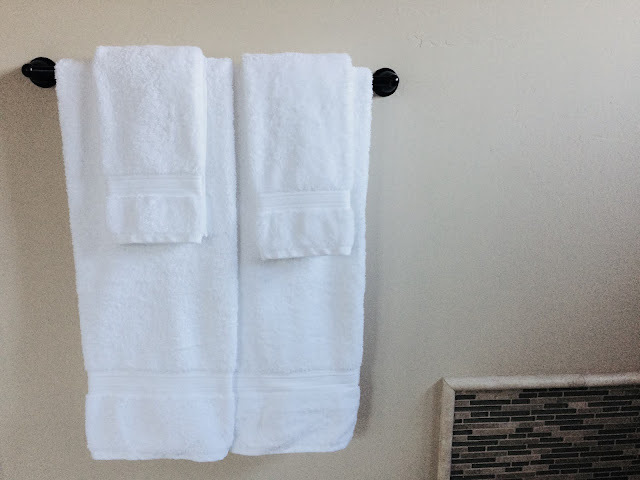 These towels similarly have almost perfect reviews from customers. I noticed one comment where someone noted that they have purchased much more expensive towels that were not nearly as good of quality as these Lands' End Supima towels. I have to agree because I know that many people look at the prices and don't realize that they should also look at the weight, type of cotton, and other characteristics when they purchase towels. Rare Supima® — the top 3% of cotton grown in the U.S.
Now let's talk about excellent quality towels for those who prefer lighter towels - The Hydrocotton Bath Towels. My husband is athletic and exercises during most of his free time. He runs alongside my son who rides his bike to/from school. He also sometimes runs for a few hours a day. (This isn't a typo - he sometimes runs for three hours a day!) As a result, he showers 2 to 3 times/day. He takes quick showers since he packs in so many runs. As a result, his preferences are different than mine. The Hydrocotton Bath Towels are the perfect fit for him. The Hydrocotton uses Turkish cotton yarns that are hollow and that absorb extremely well. The towels weigh 450 grams per square meter. They are perfect for athletes who want excellent quality towels that absorb moisture quickly, but also want their towels to dry quickly. Finally, I love soft bath mats that are easy to wash. We've gone through phases where we have tried different types of bath mats such as memory foam mats or decorative mats. Over the years, we've eventually circled back to simple and soft bath mats that are easy to toss into the washer and dryer. As a busy mom, simplicity and softness have become my top criteria. We love the Turkish Textured Bath Rug. Similar to the bath towels mentioned above, this bath rug is incredibly soft, absorbent, and holds up well over time. It weighs a whopping 1,200 grams per square meter and has an anti-pill finish. It uses the Turkish cotton (with long fibers) that we all know provides an amazing softness, absorbency, and durability. It was created to match the towel sets above. Best of all, it's so easy to toss into the washer when I clean our bathrooms. In summary, purchasing top quality towels is easy if you understand the characteristics to look for such as brand, weight, type of cotton, and banded edges. There isn't a one-size solution for everyone since different people have individual preferences, but there are certainly key characteristics that help you to understand your purchase and what to expect. You should also give careful attention to washing and drying your towels so that they maintain their absorbency and durability. Personally, we recommend Lands' End because they have curated a collection of towels that are excellent quality and that span a variety of personal preferences. Check out their bath towels here.